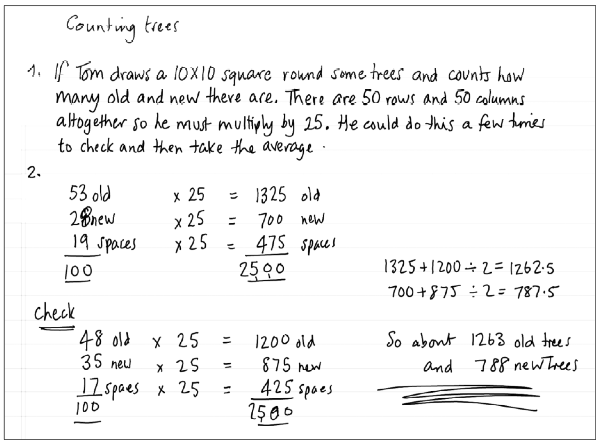 Before the lesson, students attempt the Counting Trees task individually. You then assess their responses and formulate questions that will prompt students to improve their work. Next, students work in small groups to combine their thinking and work together to produce a collaborative solution to the Counting Trees task, in the form of a poster. Working in the same small groups, students evaluate and comment on sample responses, identifying the strengths and mistakes and comparing them with their own work. In a follow-up lesson, students reflect on their work and their learning. Each individual student will need a copy of the task Counting Trees, at least one copy of The Tree Farm, and a copy of the How Did You Work? questionnaire. Each small group of students will need at least one enlarged copy of The Tree Farm, a sheet of poster paper, a glue stick, felt-tipped pens, and copies of the Sample Responses to Discuss. 15 minutes before the lesson, a 95-minute lesson (or two 50-minute lessons), and 10 minutes in a follow-up lesson. Exact timings will depend on the needs of your class.